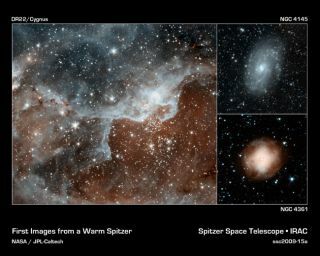 These images are some of the first to be taken during Spitzer's warm mission. At left is a cloud, known as DR22, bursting with new stars in the Cygnus region of the sky. The picture at upper right shows a relatively calm galaxy called NGC 4145. The final picture at lower right shows a dying star called NGC 4361. NASA'sSpitzer Space Telescope has officially started its ?Warm Mission? after takingits first shots of the cosmos since it ran out of coolant in May. A set of new imagestaken with two of Spitzer's infrared detector channels ? two that work at the newwarmer temperature (a still frosty minus 406 degrees Fahrenheit, or -243 C)? demonstrate the observatory remains a powerful tool for probing the dustyuniverse more than five-and-a-half-years after it was launched into space. The imagesshow a bustling star-forming region, the remains of a star similar to the sun,and a swirling galaxy lined with stars. "Theperformance of the two short wavelength channels of Spitzer's Infrared ArrayCamera is essentially unchanged from what it was before the observatory'sliquid helium was exhausted," said Doug Hudgins, the Spitzer programscientist at NASA Headquarters in Washington, D.C. "To put that inperspective, that means Spitzer's sensitivity at those wavelengths is stillroughly the same as a 30-meter ground-based telescope." The firstof three images shows a cloud bursting with stars in the Cygnus region of ourMilky Way galaxy. Spitzer's infraredeyes peer through and see dust, revealing young stars tucked in dustynests. A secondimage shows a nearby dying star -- a planetary nebula called NGC 4361 - whichhas outer layers that expand outward in the rare form of four jets. The lastpicture is of a classic spiral galaxy called NGC 4145, located approximately 68million light-years from Earth. "WithSpitzer's remaining shorter-wavelength bands, we can continue to see throughthe dust in galaxies and get a better look at the overall populations ofstars," said Robert Hurt, imaging specialist for Spitzer at NASA's SpitzerScience Center at Caltech in Pasadena, Calif. "All stars are equal in theinfrared." WarmSpitzer will address many of the same science questions as before. It also willtackle new projects, such as refining estimates of Hubble's constant, orthe rate at which our universe is stretching apart; searching for galaxies atthe edge of the universe; characterizing more than 700 near-Earth objects, orasteroids and comets with orbits that pass close to our planet; and studyingthe atmospheres of giant gas planets expected to be discovered soon by NASA'sKepler mission.